The alarm clock wakes me up at 7 AM. I get out of bed quickly, driven by the nervous excitement of someone who is about to begin a new adventure. Everything is ready to go and exactly as I left it the night before, but just in case, I go through a mental checklist of all the gear as I prepare breakfast. The experience I gained on previous adventures served as a guide when choosing what to bring on this trip. My legs were already familiar with the senseless suffering of carrying excess weight in panniers that are bursting at the seams with equipment for outlandish situations that only a rampant imagination could dream of. So on this trip I decided to take a minimalist approach and tackle the adventure through the perspective of bikepacking. As I stir my coffee and take a bite of my toast, I go over everything in my head: “Handlebar bag”: Sleeping bag, spare biking jerseys and shorts (two of each), additional riding apparel (arm and leg warmers, half-finger and full-finger gloves, etc.). All of this is packed in a waterproof bag, which is an essential feature for a bag that is exposed to the elements. Little did I know how much I would appreciate this peace of mind, but the days that followed would make it abundantly clear. Upon completing my mental checklist, I inspect everything one last time to make sure nothing is left behind. I make my way to “El Junco”, the bar-restaurant where I will meet Fernando, my loyal travel companion (through thick and thin) for the next six days and also the driving force behind this adventure. After greeting each other with a warm hug, we finally begin our journey. There are six days between us and Santiago de Compostela, riding along secondary roads and dirt paths. Our gravel bikes have been fitted with slick-tread tires and bags on every side. As we ride around the Manzanares el Real reservoir, we gaze up at the castle and notice that our speed is much faster than if we were carrying traditional panniers. This bikepacking alternative seems to be a great idea! 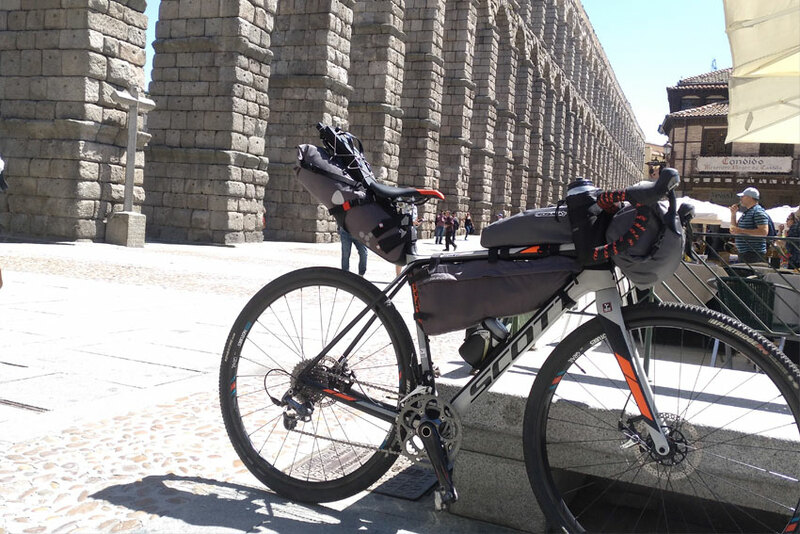 Fernando and I chat about how little the seat bag moves, despite everything stuffed inside, and take note of the excellent design of the straps on my bag compared with his, which shifts around a bit more. We’re like two kids talking about their new toys! Immersed in conversation and swept away by the stunning landscape, we reach the first climb of the day: Navacerrada. This is when I will discover whether the weight I am carrying will hold me back and whether my gearbox will fall short (36 chainring and 34 cassette) on the 12% upward inclines that await. This bikepacking alternative seems to be a great idea! Upon reaching the peak, I confirmed that this was the right biking concept for the trip. I was able to climb with ease and faster than on a bike fitted with panniers, especially when standing up, since the bags do not create strange inertia forces. It took one hour and ten minutes to conquer Navacerrada. Steep slopes and curves marked our path to the 1,858 meter elevation, the highest level on our journey to Santiago. It’s time to prepare the descent, so we put on our arm warmers and windshell vest to make our way down the mountain. Despite the sun, the temperature barely reaches 54 °F (12 °C) at this spot. I had planned ahead by packing these items in the large bag of the main triangle. The magnificent design of the bag’s compartments makes it possible for me to carry food, a recovery supplement, radios, tools and other items, in addition to my apparel, in such a way that everything is kept separate and nothing shifts if an item is taken out. We head towards Segovia. This is one of the most beautiful parts of the trip. Valsaín forest accompanies us to the Royal Palace of La Granja de San Ildefonso, where upon passing the Pontón Alto reservoir, we enter the plateau that will continue for several days. A required stop in Segovia is the city’s famous aqueduct. Although I have seen it countless times, it never ceases to amaze me. We bid farewell to the city and take the winding road at the base of the Alcázar. The trees that line the road provide welcome shade until we reach the Zamarramala crossing. From here, we climb the hill to the Ermita Templaria de la Vera Cruz (Church of the True Cross), a unique Romanesque construction that architecture lovers will truly appreciate. Upon passing the Pontón Alto reservoir, we will travel through the plateau for several days. After a pleasant lunch at San Marcos restaurant (a true classic in the region), we point our handlebars towards Nava de la Asunción, which will mark the end of this first day of riding. This is the point where we can see the type of terrain that will fill the next two days. The Castilian plains are fields of crops (primarily grain) that, due to the spring rains, are lush and green. A gift for the eyes. The hostel in Nava de la Asunción is housed in the sports facility and consists of a small room equipped with bunkbeds and a kitchen. It’s perfect for the two of us and a German traveler with whom we chat and dine thanks to the comradery that is built by the Camino de Santiago. Day 1 comes to an end without any setbacks and all the gear is in perfect condition. Now it’s time to sleep.